Keaton Jennings knows the harsh realities of life at the top level and is aware that only a significant number of runs will keep him in England’s Test squad. The Lancashire batsman looked to have finally cemented his place at the top of the order with a sensational 146 not out in Sri Lanka. But he has struggled since, failing to reach 30 in any of his subsequent eight international innings amid some familiar weaknesses against pace bowling. Having been dropped for the second Test in West Indies, Jennings was brought back for the concluding match of the series. 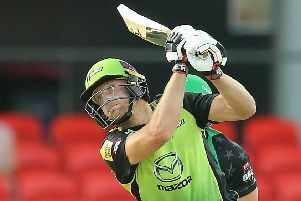 Many felt that may have been a valedictory appearance but Jennings is well-known for his mental fortitude and believes that could count in his favour in the upcoming months. Speaking at Lancashire’s media day, Jennings said: “It was a tough winter. From a personal point of view it was really hard work. “Mentally the disintegration when you see yourself in the news, especially when you aren’t doing well, is tough to handle. “I’ve always been a level-headed guy. I think I’ve been quite good at staying isolated in the last 18 months, which is probably why I’ve stayed sane at times. “I’ve also had the love of my family, which has been fantastic, but it is hard. “You can walk into a room and feel like everybody is thinking about you playing a cover drive when in reality people are actually going on about their day. You need to take cricket out of your personal life. “But it’s professional sport and you need to bounce back. There’s no point going to bed and crying yourself to sleep because at the end of the day I’ve got a job to do. “I’m paid to open the batting and score runs and that is the reality of it. If you stop doing that, then you need to find another job. Jennings is phlegmatic about Lancashire’s relegation to Division Two in the County Championship, arguably depriving him of the opportunity to press his claims against some of the country’s top pacemen. But he is relishing the chance to prove himself ahead of this summer’s Ashes. Jennings added: “The joy is that everything’s open. It’s the weight of runs that are going to get guys places. “I’m not playing in Division One this year. I can’t control that. “But Division Two doesn’t mean guys are suddenly bowling underarm. There are professional teams who are highly skilled and everyone wants to win.